Natural products like Indian almond bark, Indian almond leaves or alder cones can further the health of your fish and shrimps and will also improve water quality in addition. The humic acids contained in these natural products have a highly beneficial effect on fish and shrimps. Shrimps will unrelentingly graze on the biofilm forming on Indian almond leaves and bark, and in addition to the biofilm, they take up a lot of dietary fibre, too, which is good for them. Natural products are welcome and useful additions to a shrimp aquarium. In our online shop we offer you a well-balanced assortment of natural additives and natural products to buy, which you can use to make life pleasant for your dwarf shrimp. Indian almond leaves are very popular in aquaristics. 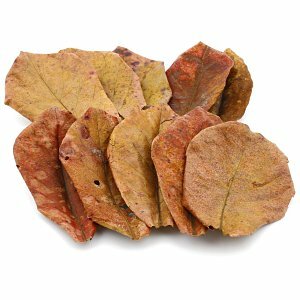 These leaves of the Indian sea almond tree Terminalia catappa not only contain plenty of tannins and humic substances, which make the water suitable for shrimp and fish, they are also effective against bacteria, fungi and other germs. Dwarf shrimps also like to graze the leaves and feed on the biofilms that form on them. Later, when the leaf tissue has been broken down by bacterial activity, the small crawlers will also eat the leaf itself. The leaves are also excellent hiding places for shrimp and look beautifully natural in the aquarium. Almond tree leaves can remain in the aquarium until only the leaf skeleton remains. If you want to take advantage of the antibacterial effect of the Catappa leaves, you should add a new leaf every two weeks, because after that time hardly any active ingredients are released. Dosing with a liquid extract, e.g. 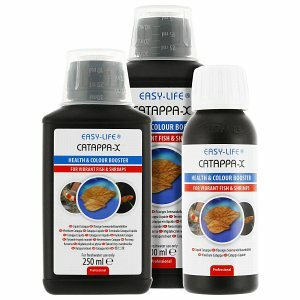 Catappa X is more reliable and has the additional benefit of not tinting the water, which may happen when using Catappa leaves. The bark of the almond tree is more effective. It is used in case of acute bacterial infections, but can also be given into the aquarium (in smaller doses) as a preventive measure. The bark can remain in the tank as well after serving its purpose. 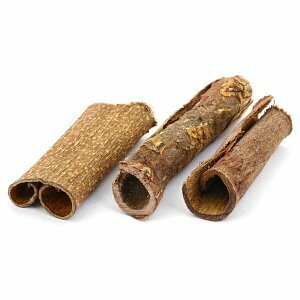 Especially attractive are caves and tubes made from the bark, which serve shrimp and Cambarellus dwarf cray as hiding places for a long time after having taken their helpful effect. Almond tree leaves and bark are available in our shop in various sizes and from various brands like Dennerle and JBL. Another proven remedy against bacterial infections are cinnamon sticks from the bark of the Ceylon cinnamon tree. They can also remain in the aquarium as a hiding place once they have released their active ingredients. For acute infections, add a maximum of 5 cinnamon sticks per 60l of aquarium water and add more after two weeks if the problems persist. Dried fennel greens are often recommended in case of bacterial infections. When fed to dwarf shrimp, it acts internally against acute diseases, but it can also be fed prophylactically. Beech leaves, oak leaves and other brown leaves as well as alder cones (e.g. 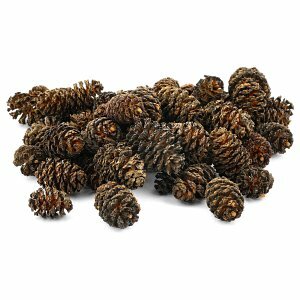 Dennerle's Black Cones) are another proven way of introducing humic substances and tanning agents into the aquarium to prevent diseases. They may colour the water slightly brownish, but it is this amber shimmer that really makes the colours of the plants and fish in the aquarium shine. Shrimps, cray and dwarf cray can hide in leaf accumulations, and brown autumn leaves look really beautiful in an aquarium modeled on nature and can be used as a further, useful decorative element with additional benefits. Humic substances and tanning agents not only have a mild antibacterial effect, they also make the water pleasant for shrimp and fish and help crustaceans to moult. 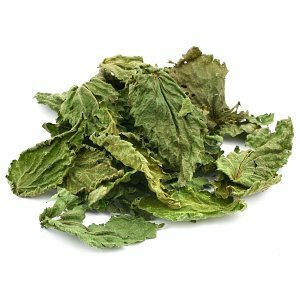 Green, dried leaves (chestnut leaves, aspen leaves, cherry leaves, apple leaves and so on) as well as green forage (dried dandelion, raspberry leaves, blackberry leaves etc. 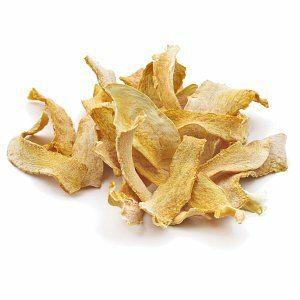 ), dried vegetable chips from Hokkaido pumpkin or courgette should not remain in the aquarium, but either only be fed in small quantities or removed if they have not been completely eaten after several hours. An exception are dried green walnut leaves and dried green birch leaves. The former work well in case of bacterial infections and also prophylactic, the latter are a useful remedy against fungal diseases. Both leaves must not be overdosed, but may remain in the aquarium in small quantities. 1 leaf per 20l of water should be unproblematic. 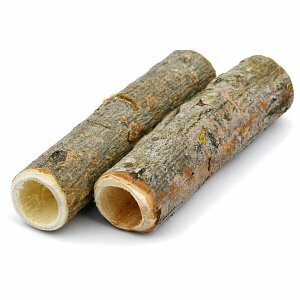 As an alternative to birch leaves you can also add birch bark to the aquarium. Turkish hazelnuts have a purely decorative effect, and are increasing in popularity as aquarium decoration, hiding places and shrimp playground.